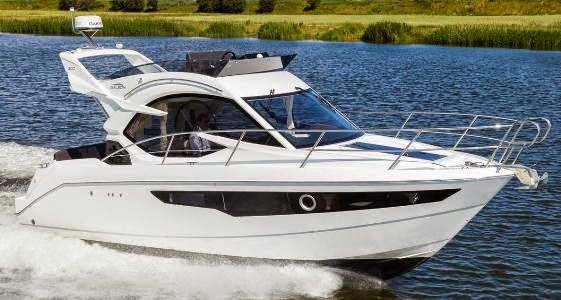 Princess present the project for a new 68 model to debut in Autumn of this year, and fitting into its flybridge range between the 64 and 72 models. The new 68 enjoys the highest level of internal volume ever created by Princess for a given length, delivering four cabins, a vast deck saloon and a flybridge and twin cockpits. But aside from the simple virtue of space, the 68 will also come packed with features, many of which are a first for a yacht of this size. Across the main deck level, a galley aft layout allows dining options inside and out, being perfectly placed to serve the cockpit. The synergy between interior and deck is further enhanced by an electric window that turns the aft galley countertop into a serving bar for the cockpit. A small step up from the inside dining area, the deck saloon enjoys incredible views from the full height side windows, while ahead the helm position is joined by a raised L-shape seating to port, so friends and family can all be involved when underway. The 68's master stateroom features a private stairwell and lobby, the guest cabins being accessed by a separate stairwell forward. This unique design creates a real sense of motor yacht sophistication for the owner as well as total privacy for those onboard. On deck, the aft cockpit is designed to be the main dining area and comes suitably dressed with mood lighting, beautifully upholstered seating for eight and a large teak table. 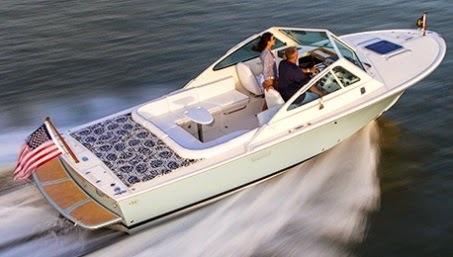 After dinner you might choose to retreat to the bathing platform where an aft-facing twin seat is set into the transom. At the bow, a walk-through fore-deck comes complete with an elegant seating area, large sun-pad and stowage. The flybridge above boasts vast sections of seating with the ability to seat five people across the helm area, a full wet-bar, and the added ability to convert the forward seating into a large sun-pad. Powered by twin 1400hp engines out at sea, the Princess 68 will deliver 34 knots top speed and efficient cruise in the medium twenty knots range. It's the third model of the innovative Rivera SUV line, and this new 515 stands in the middle of this fairly new line which debuted only a couple years back with the 445. The 515 SUV keeps the rugged line bit sport fisherman and yacht of the range, which seems to be gaining new fans each time a new model is launched. For the 515 SUV Riviera based itself on a new keel type Vee hull shape, created on purpose for pod drives, from both Volvo IPS and the ZF Zeus series. In its accommodation solutions there is a lot to like in the 515 SUV; from its multi-purpose mezzanine sport fish inspired aft deck, and the latest of the European design trends used inside. Surely the C-shaped aft positioned galley will be a favorite of many. Below the 445 SUV offers a three double cabins layout with two heads. For below an option for the port side cabin exists, which can be ordered with twin berths or as a double bed, this last transforming this room as the owners in lieu of the one to fore which becomes a VIP. Power options for the Riviera 515 SUV are three engines which start from Cummins 600hp up to twin Volvo 725hp. 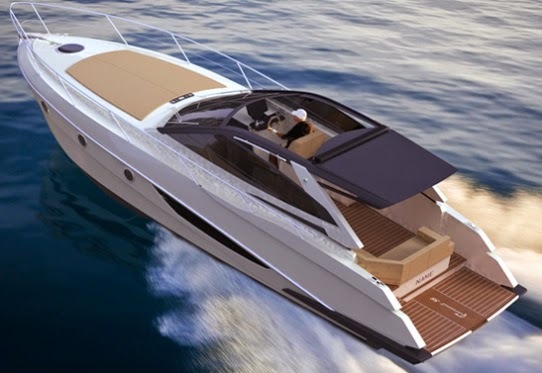 Polish builder Galeon is very fast to capitulate on a new platform and just after the launch of the 300 Fly, presents a project for a hard top sports cruiser based on the same hull the 305 HTS. Unlike some other Fly and HTS transformations from Galeon though, the new 305 HTS is not just a hard top model without a flybridge, as here the Polish builder redesigns the cockpit into a full open space area with a sun-pad, C-shaped dinette, and wet bar. Below is also changes with the forward double berth replaced by a C-shape settee. Interestingly another big news in the 305 HTS is the signature of design entrusted to Italian architect Roberto Curto, who has been collaborating on Galeon sister small models brand Galia. Curto also designed the 300 Fly. This latest Sunseeker 50 San Remo comes from a long standing bloodline of a model which have been extended and modified since over a decade. Could this be the last interpretation of this hull? The 50 San Remo though bears a lot of similarities to its predecessor, the 48 Portofino, from the looks to a similar interior, which here comes added with an important third cabin transformation option. Still the San Remo is still a bit different on the outside, the hard top is a bit higher and curved, and the hull bears the latest larger then large Sunseeker signature side windows. On the technical side of things the 50 San Remo continues to be Sunseeker IPS only powered boat. Meaning that the San Remo can only be powered with IPS pod drives, and unlike other Sunseeker models there is no other propulsion options. Heesen Yachts is proud to announce that the 47m displacement, YN 16947 Project Hé, was sold on June 13, 2014. Mark Cavendish sales and marketing director at Heesen Yachts commented that this is the fourth contract signed in the first six months of 2014. Project Hé is a yacht in the 47-metre class, a breed of Heesens that are icons of classic contemporary yacht design. Frank Laupman from Omega Architects recently restyled the elegant exterior lines giving this vessel a new look. Her well-engineered round bilge hull with bulbous bow, powered by two MTU 1361hp, will ensure smooth and safe cruising in all sea conditions and a range of 4000 nm at 12 knots, while zero speed stabilizers will guarantee maximum comfort at anchor. The sophisticated interior is by London-based and multi-award winning studio Bannenberg and Rowell Design who are on their fifth successful collaboration with Heesen. The fleet includes the 37m Aurelia, 47m Elandess (now Raasta), Lady Petra and My Secret, and the 65m Galactica Star. Dickie Bannenberg explains how his studio explored themes of purity and simplicity for this project, always confident that Heesen would interpret their concept immaculately as with their previous joint projects. Guru designer Dieter Rams’ motto “to omit everything superfluous so that the essential is shown to the best possible advantage” guided Bannenberg and Rowell in their approach to the interior design of Project Hé. The project name ‘Hé’ in Chinese means ‘the simplest form of peace and harmony’ and Bannenberg and Rowell chose it to unify in one ideogram the essence of their design theme: simplicity as the ultimate form of sophistication. Twelve guests will enjoy a relaxing atmosphere on board where restful colors are combined with natural and discreet contrast finishes. An important role is played by the use of light: indirect lighting concealed LED light strips and filtered thanks to refined venetian blinds which create a unique atmosphere on board Project Hé. Heesen YN 16947 will be delivered to her owners in February 2015. The 2014 Sydney International Boat Show opens next week with both the Sydney Exhibition Centre at Glebe Island and the Cockle Bay Marina at Darling Harbor filled to capacity. The show presents everything the water-loving Aussie could ever wish for. More than 60,000 visitors are expected at the show which, for the first time, is being held across two spectacular harbor venues, both available on the one ticket, with transport between the venues included for free. Opening Thursday 31 July, more than 150 boats will be on display at Darling Harbor, ranging from the more modest, to the most luxurious, making up part of the recreational marine industry valued at eight billion Australian dollars. 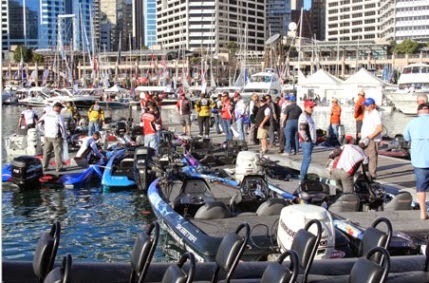 A free continuous harbour ferry service will transport visitors from Darling Harbor across to the Sydney Exhibition Centre at Glebe Island where an additional 210 exhibitors will display Trailer Boats, the latest gadgets and leading products available to recreational boaters this year. The Exhibition Centre at Glebe Island can also be accessed via a free continuous shuttle bus service operating to and from Central Station. As usual Sydney boat will be host to some important novelties, with the most noteworthy being the Riviera 6000 Sport Yacht. The marina of the well-known town on the Adriatic coast, in the province of Forlì-Cesena, was the venue on July 18 for the launch of hull one of the Ferretti 650, the new yacht of Ferretti Group’s historical mother brand, which marks the continued renovation of the Yachts line below seventy feet in length. The technical launch of a yacht is always a very important achievement for all Group employees, who over the last few months have been involved in the building of this model at Forlì production plant, where the next two hulls of the new 65-footer are also currently under construction. The new boat will officially make its debut in front of the international public during the next edition of the Cannes boats show, which as usual will be held in early September. It will then be presented as an Italian premiere at Genoa Boat Show. The Ferretti Yachts 650 is yet another magnificent result of the cooperation between Ferretti Group’s Product Strategy Committee, the Group’s Marketing Department, Advanced Yachts Technology and Design and Studio Zuccon International Project. Over the next few weeks, all required technical operations from RINA the Italian Register of Shipping, inspections and testing to sea trials, all the way to the verification of onboard systems and equipment and the completion of the interior outfitting will be carried out to complete Ferretti Yachts 650’s preparation for its official debut at the various boat shows. The great interest raised by the 650 at an international level is confirmed by the success this project has already received, just a few months after its project presentation: indeed, the first hull was sold to a Chinese owner even before it was launched, a fact that bears witness to the increasing interest the brand is attracting on the leading market of the Asia-Pacific region. The second hull, in turn, will go to an Owner from Lebanon, a country in the Middle East that has always been strategic for the Italian brand. The third 65-footer which is to be the first in the flybridge version with hard top will reach the United States in 2015. Cranchi shows off a rendering of what will be a very important novelty for the fall boat shows of 2014, the new 40/43 Eco Trawler LD. To be presented in Cannes this 40/43 project is the second model of Cranchi Trawler range and follows on what the 53 LD brought in looks and technical details. That equals to space in all areas, and good range and handling at moderate slow speeds. As the above rendering tells us the 40/43 is to be powered by Volvo IPS pod drives, and will feature a semi planning hull. This new smaller Eco Trawler will feature full view windows below, covering all the cabins, and by the looks of this rendering makes best use of space in the lower deck. For example see how far aft that window is. No layout information yet, but watch this space for more. What a beautiful boat, that is in few words what this picture say of the new Camper and Nicholsons 50 Velsheda. Owned by Leonardo Ferragamo since a few years, Camper and Nicholsons became the power boating arm of Nautor Holdings group who also owns one of the most appreciated production sail boat brands; Nautor Swan since the late nineties. 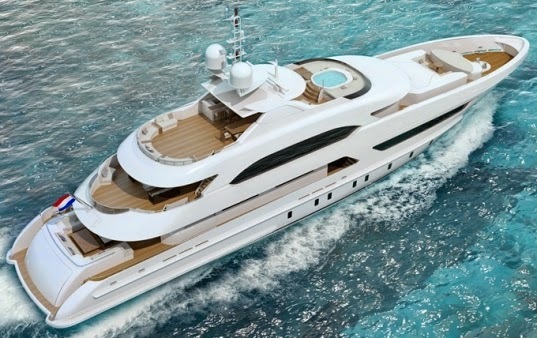 With 50 Velsheda, Camper and Nicholsons follow what was presented with the 42 Endevour in a bigger yacht size dimension. In reality the Velsheda tells you instantly she is the larger sister of the Endeavour, and as the 42 feet model does take hints from a down east lobster boat design mixed that of a classic fast commuter for its looks, creating a unique design. The 50 Velsheda cockpit deck will impress for its spaces; central sun-pad, two L-shape aft looking small mezzanine style settees, C-shape dinette, L-shaped galley, and a helm station to starboard is what the main deck offers. Below the Velsheda offers two cabins with an owners room to fore, and a nice L-shaped lounger. A single berth crew cabin is located amidships starboard. Power is twin Cats 669 or 715hp with line shafts giving top speeds up to 33 knots in light load. American Tug presents its new World wide web showroom. American Tug is the project of Tomco Marine Group, as founded by Tom Nelson. Today Tomco Marine Group is directed by three persons; Tom, Mike Schoppert, and Kurt Dilworth. All three have been in the marine industry since the eighties, with the experience coming from various other boat builders before eventually forming Tomco Marine Group. The American Tug concept happened after various meeting with renowned West coast designer Lynn Senour. Currently American Tugs range features four models; 365, 385, 435, and the just launched 485. American Tugs new web site takes you around with the following buttons; Home, About, Models, News, Dealer, Contact, American Tugs and Trawler Blogs, and Store. American Tugs has also its Facebook social media page with a link at the left bottom of the entry page. In mid June 2014 Admiral part of the Italian Sea Group since a few years launched the new 45 Regale. A Luca Dini design, the Regale line is a continuation of the original Admiral lines aluminium constructed fast planning as coming from the Lavagna stable before the company had financial difficulties in the midst following the 2009 recession. Titled Flying Dragon this latest Admiral is the third and largest super yacht launch from the Italian Sea Group for 2014. 45 Regale hull one features five guest cabins with an owners room on the main deck, and four guest cabins below. Four crew cabins sleeping six or seven crew members are located in a crew lobby area forward of the guest cabins below. This area also includes a galley, and lounging relaxing dinette for the crew. Power is twin 3460hp MTU engines which give top speeds of 26 knots. Project MaYa, is a custom larger version of the Dariel UP design developed specifically for a client requesting a sport yacht suitable for short adventures to nearby islands and overnight getaways. With opulent comfort, the layout has been modified to maximize the living area for a couple plus two crew rather than the typical multiple three cabin configuration in sport yachts of this size. The prerequisites of the client are for cruising speeds of 35 knots and maximum in excess of 50 with twin MAN 1800hp engines coupled to Arneson surface Drives. The cabin configuration has a full beam master suite forward and a twin bed crew cabin aft specifically designed for a couples romantic weekend away with five star service from the crew.The Project Maya is a collaboration between Dariel & Stephen Crone of Acronautic who represents the brand in Asia Pacific. Stephen Crone, Managing Director of Acronautic provides specialist yacht management, professional consultation and client representation for unique projects under 30m throughout Asia and Australia. Majesty Yachts head line brand of the middle East Dubai located boat builder Gulf Craft, presents its new entry level model the 48. This fourteen meter flybridge motor cruiser from Majesty impresses for its interior accommodation plan, and large spacious flybridge. Considering it is a line shaft boat, the accommodation on offer is indeed impressive, and this is achieved to a wider then usual beam for the length on offer. The lower deck of the Majesty 48 is amazingly spacious and offers three double cabins, with the hall mark here being the full beam owners cabins amidships. The other two cabins are the double queen size berth VIP to fore, and a third twin berth room located to starboard. To port is a guest head, while aft is an optional crew cabin with single berth and shower head. The interior of the main deck is a split level saloon divided with two steps. The entrance offers an L-shaped galley and dinette, and the forward raised area offers a C-shaped dinette to port, with an opposite helm station and a second L-shape lounger to starboard. Based on the hull shape of the recently launched Henriques 50 Flybridge, this New Jersey boat builder is fast to capitalize and present a project for an Express HT model. This new Henriques follows the concept of the year ago launched 42 HT with a nice stylish integrated three piece hard top wrap around wind screen covering half of the cockpit. The standard interior layout of the 50 Express HT will offer two cabins; owners room to fore, twin bunk berth cabin to starboard, shower head, and an L-shaped galley and L-shape dinette looking opposite each other to starboard. The cockpit as any decent sport-fisherman will be a free aft deck, and the raised controlling area offering three forward looking drive and co-pilot settees with central helm station, and a large L-passenger settee behind. No power has yet been announced for the 50 Express HT and Henriques is usually quite conservative on its power and speed. As an example the 50 Flybridge is powered by twin Cat 1015hp and reaches 36 knots max. Imagine the 50 Express HT to be powered by similar units and be able to reach a knot or two more. Galeon continues to present fresh new models in all sizes, and the 300 Fly is an answer to clients who want a compact yet comfortable flybridge cruiser. It is in short words an entry level Galeon, a segment which unlike other builders the Polish builder has always been very keen on. The 300 Fly replaces the 290 as Galeon's smallest and visiting model to its always expanding range, which will soon have an 82 footer as a flagship. Sleeping four berths below, plus an extra two in the convertible dinette the 300 Fly is an interesting compact flybridge cruiser. In this model as shown in its bigger units, Galeon also shows its innovative flare in the design see view windows on top and lower deck, and also in other technical solutions as the sliding cockpit settee expanding space, and an optional extended bathing platform for tender stowage aft. The finishing of the 300 Fly is also a representation of its bigger models, with hull one being finished in nice walnut wood, and a white leather mix. Power options available start from a single 225hp up to twin 260 Volvo diesel engines. Propulsion is stern drive dual propeller Volvo. Heesen Yachts is proud to announce that the first 45m fly bridge vessel YN 17145 Project Necto is sold to a yacht connoisseur with a true passion for Heesen core values: Aluminium, speed and power. This powerful sportster, the largest built by a Northern European shipyard, will be capable of thundering along at an impressive 30 knots thanks to her well-engineered all-aluminium semi-displacement hull and twin MTU engines. Speed and power combined with uncompromising luxury and comfort are the characteristics of this semi-displacement yacht that will have a range of 2750 nautical miles at 12 knots. Frank Laupman of Omega Architects has created the exterior lines of the yacht. True to form Laupman has interpreted the Dutch shipyard DNA with a touch of innovation by introducing the knuckle, a design element that interrupts the line of the raked bow and gives this new breed of Heesen its sharper and narrower bow a particularly aggressive look. The interior décor of YN 17145 is by acclaimed Italian designer Cristiano Gatto who is currently working on his third project with the Dutch shipyard. The Owners chose a contemporary yet cosy design for the interior of their 45m sportster. Warm Canaletto walnut is the main veneer, which perfectly complements the light tones of Loro Piana fabrics and the warm colours of the different finishes; pale blue soft furnishings give a relaxed and light feeling to the yacht’s interior. Ten guests will be accommodated in five cabins: The full beam master suite is located on the main deck, while the four guest cabins two twins and two doubles are on the lower deck. The owners dedicated special attention to the outdoor areas of their new vessel; the ultra-spacious sundeck is particularly impressive. As an expansive 84-square meter area, completely free from fixed furniture, it is available for guests to carry out their morning exercise, yet another unusual and particularly remarkable design feature on a yacht of this size. YN 17145 will be delivered to her Owners after intensive sea trials in the North Sea in January 2016. On June 28th, 2014 ISA Yachts launched Forever One, a 54m full displacement custom motor yacht. With her reverse bow and vibrant red and white paintwork, this latest ISA is for sure a different yacht. This fully custom five deck yacht with an aluminum superstructure and an impressive steel hull with reverse bow is designed by Horacio Bozzo Design with an interior by Alessandro Massari/Studio Massari. ISA Yachts worked in very close cooperation with the naval architect, the sales broker Fernando Nicholson, the Captain/Owner’s representative Colin Skinner and the interior designer to build a yacht full of distinctive features which make it stand out of the crowd. The layout is quite unconventional and the challenge was to fit several features that make her unique: The Owner's deck is one of the peculiarities of such vessel with a private balcony - accessible from their stateroom - and a large aft deck terrace. Fold-able bulwarks on the main deck grant a spectacular view to the exterior. Noteworthy is the glass elevator that connects all decks, from the lower deck to the flybridge. She has a spectacular dining/relaxing salon located forward on the main deck where usually are located the owner's stateroom. A spacious beach club with large fold-able stern and side platforms ideal for water toys and tenders docking give also facilitated access to the water by automatic and gentle-angled submerged stairs. The main garage is located forward on main deck and will carry a 9m tender and a 5,5m crew tender. Two Caterpillars 1911hp engines will propel this motor yacht to a speed of 16 knots with a trans-pacific range. The exterior color scheme is composed of Dupont Snow White on hull and superstructure. Red elements are painted with Dupont Rosso Corsa. Rio presents an interesting sport cruiser project the 38 Parana, with the Italian boat builder continuing its recent trend of picking model names from its archives. Judging by the beam the 38 Parana is based on the hull of the 36 Art and Air models. None the less the super structure and lines as appear on the renderings so far present seem to give the 38 Parana more sweeping sports lines and total different looks. Equaling to a totally new model. The 38 Parana is offered with two options for the lower deck, a feature which sets its apart from most mainstream competition in this size. The choice here is two cabins; VIP to fore, and a full beam owners room amidships with own en-suite shower head, or a three cabin version and a smaller L-shaped dinette and saloon. Standard power is twin Volvo 300hp with stern drives propulsion. It's been a renaissance going on since a decade plus, with offers coming from USA, Italy and England. But lets be honest, there is something special about the new Toy 47 Tender and the style of boat its represents that of the traditional down East lobster cruiser, that says use me. Could be the fat rubber rub rail, or its squarish sloop stern, surely the 47 Tender has not the usual harbor queen looks most lobster yachts and cruisers represent. The new Toy 47 Tender is a project from Nauta who did an outstanding job in presenting a classic looking yet practical boat, which the market seems to be rewarding with already five hulls sold in less to a year since hull one was launched. Day users will surely like the gigantic cockpit which uses two thirds of the 47 Tender length, an area divided for sun worshipers with the sun-pads and lounging forward thanks to the two C-shaped dinettes. Down below is space for two cabins, shower head, galley, and an utility room. Owners room is located to fore. Power is twin Cummins 480hp engines with ZF pod drives propulsion giving max speeds of 35 knots. With the arrival of the Azimut Atlantis 50 Open, the options for cruising enjoyment have just doubled. The Azimut Atlantis 50 Coupè has been available since last autumn and the new Open version debuts at boat shows starting September 2014. 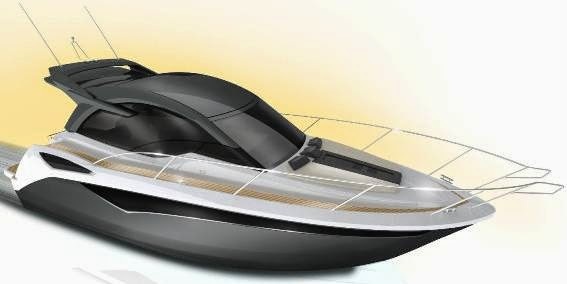 Same quality and performance to meet the needs of those who wish to enjoy the sea with different styles. In keeping with the core philosophy of the Atlantis collection sport cruisers and yachts, the Open offers the utmost in cruising pleasure and comfort with highly live-able exterior spaces and well-thought-out furnishings. In particular, the sofa is in a new U-shaped configuration with added seating facing the stern sun pad, which also houses the life raft. In the Open version, the main deck is all on one level separated by just a few steps from the stern swimming platform. The exterior kitchen on the starboard side includes a stainless steel sink, refrigerator, icemaker, and barbecue. The Open has all teak floors while the Coupè marks the distinction between inside and outside with different flooring materials. The two versions share the same layout and engine configuration. At the stern there is plenty of space for a sun-pad with platform lift enabling up to a 2.4-metre tender to be housed in the garage below; they also feature well-designed and functional cockpit furnishings. The hardtop is electronically operated. With the optional third cabin supplementing the Owner's and VIP cabin, the Azimut Atlantis 50 can accommodate from four to six guests. The full beam master cabin is located amidships, the ideal position for maximum comfort, reducing any sensations of rolling or pitching to a minimum. The completely restyled kitchen is in an L configuration and includes a built-in refrigerator and four-burner, glass-ceramic cooktop. The Azimut Atlantis 50 Open is fitted with two Cummins 600hp engines that allow a maximum speed of 32 knots and cruise at 28. Sharing the same hull as the Hunt 25 Harrier, is the new 25 Sport. This new Hunt 25 Harrier Sport is designed for maximum fun and minimum maintenance, offering a more raw environment versus the standard version. The 25 Sport offers a small cabin which features a berth and head for the over-night. The Sport’s offers modern yet retro-classic, timeless looks will be fresh a generation from now as it does today. Unlike the standard 25 Harried, the Sport offers a very basic cockpit layout with an aft sun-pad, C-shaped settee with central small table and two forward looking driver and co-pilot settees. As a Hunt it will feature a rough water C.Raymond Hunt and Associates hull which will deliver a solid cruise to your destination. The Hunt 25 Harrier Sport can be power by Volvo gas engines from 320 up to 480hp, and a diesel choice of 300hp. A Yamaha 300hp outboard option is also available. Joining forces with international architects Foster plus Partners, Alen Yachts presents its new 68 flagship model. Foster and Partners follow what Alen has produced in recent years, a sport yacht design with classic clean timeless lines, and a focus towards larger exterior lounging and entertainment areas. The exterior of the Alen 68 is also available in two options, C-shaped settee, or a dinette with two opposite facing settees. Still down below the Alen 68 can have a three cabins layout, or a more lounging area based plan with one midships owners cabin and large lounger to fore, dedicating to chilling. Power is twin MAN 1550hp engines which give top speed of 45 knots. At the beginning of the year Wider announced it has started production of the newest addition to its revolutionary fleet: the sleek yet spacious 32. Designed by Fulvio De Simoni as the perfect tender to the Wider 150 or any other super yacht, this highly versatile model is equally suited to use as a fast, comfortable sport cruiser. Wider are proud to announce the 32 has now been launched on schedule and is ready for inspection. As you would expect from a Wider yacht, the new 32’ is easily distinguishable from other express cruisers. Its dominant axe bow and low transom give the impression it is leaping out of the water, eager to slice through the waves. The three meters beam tapers only slightly towards the bow in order to provide maximum cockpit space and freedom of movement, and to facilitate boarding from a mother ship. The cockpit is designed to be easily adapted to the owner’s specific requirements, accommodating as many different configurations as possible from an inviting dining area with folding table to a nice sunbathing platform. The Wider 32’ also comes with an adjustable, easily installed awning to shade the entire cockpit. Below deck, the stylish cabin is furnished with two facing sofas that provide comfortable seating for entertaining or ship-to-shore transportation protected from the weather; they also convert into spacious berths for overnight stays on board. The galley, equipped with sink, stove ring and refrigerator, disappears seamlessly into the contemporary cabinetry. A surprisingly large, full-beam head with shower is housed in the bow. Storage for personal belongings is maximized throughout the Wider 32. The hull is designed to provide a smooth ride and excellent performance. Twin 260hp Mercruiser diesel engines mated to stern drives deliver a cruising speed of 30 knots and a top speed of 37. With a positive outlook for the next upcoming years in boat building, how did the various countries and boat builders handle the downturn which went on from 2009 till 2012 and 2013 being more or less a flat year. I will put here a personal perspective how the main production, semi-custom leisure boat building countries handled the largest recession since the depression of the nineteen thirties. Britain and its main builders have had an interesting build up with a turbulent background story behind. The three British builders have in reality changed ownership with the best move coming from Princess who was purchased by a French finance mostly involved in fashion at the start of the crisis. Sunseeker and Fairline both had a weak period with the first nearly going down, and purchased by a Chinese businessman in Summer 2013. Whats interesting in all this that while the background was rough, the British boat builders increased an impressive amount of brand recognition in the general public eyes, thanks to one of the best price value ratio in the industry and a global network. Another known British builder Sealine did not manage to save itself, and ended up moving production in Germany and now being Hanse owned. The country in producing most boats in the World, the United States of America had a similar picture of what happened in the early nineties in the midst of the luxury tax. But this time around instead of large boat builders buying smaller ones and becoming groups, we had for the most part financial houses coming in. The North American continent is always an interesting varied market but the main problem seems that most companies seems to over produce, and also lack brand building. Its interesting to see that most US builders stop at about 50 feet max length, a maximum size they had a decade ago and never expanded over this. Still the USA has the best examples to follow how to handle a downturn, with Viking and the custom sportfish boat builders of the East emerging stronger then ever after the recession was over. The interesting part is that these builders are all family owned with a huge drive coming from passion. Italy had a depressing story, and while the recession did its damage, the biggest hit to most builders in the shoe shaped peninsula especially those dependent on the home market came from within thanks to a suicide political move which left all losers. Italy has always been about those small medium sized builders which build for the most part about twenty boats a year. But even global giant Azimut Benetti Group still a family owned corporate and the largest super yacht builder of 24 meters plus for nearly two decades felt a few cracks here and there. 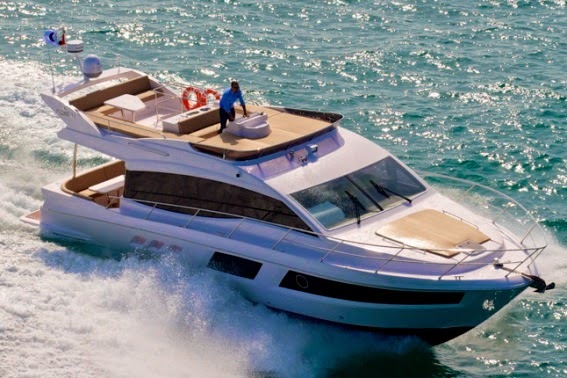 The other giant Ferretti Group and its brands had trouble for the most part of the own making, saved by the banks and then bought for 75% by a Chinese businessmen. Those financial houses always pull the ropes when the weather gets rough. 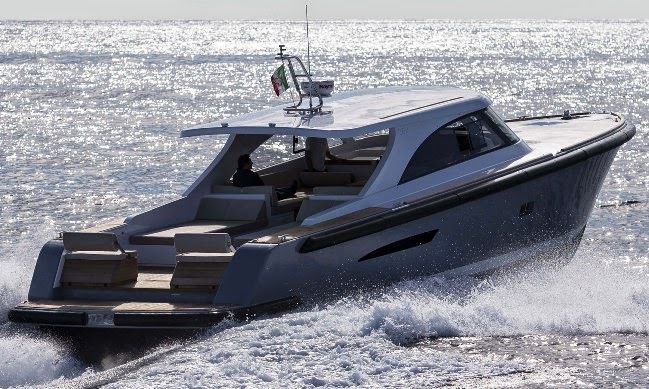 A company which came out stronger from this downturn was Absolute a fairly young brand founded in 2002, but with Gobbi being an experienced since 1960 boat builder at the helm. Today Absolute along with Azimut-Atlantis is the Italian answer to the British trio in production boat building. At the moment a shy turn around is happening in Italy and some of the small medium sized builders which closed there doors are trying to open up again. But after all that damage most small and semi custom builders will have a difficult task competing with what the Dutch builders are offering. The picture in Italy back in 2011 was also more tragic when one considers that as at 2007 it was the largest boat selling market in Europe thanks to the leasing schemes in operation at the time. The Dutch shown how they are ready to compete in this market, but what impressed the most was that they have shown a huge capability in making group and going to boat shows together, under one flag. This has created a new identity to Dutch smaller size builders, with some not much known names becoming the new thing to be. The rest was an interesting story, when you think France the Beneteau Group comes to mind, and the French giant in the recession has all been about expanding and taking new market shares. Spain had a terrible crisis, among the worst in Europe and most small medium sized builders who cropped up during the boom period, did disappear during the recession, that is apart Astondoa who still continued to grow, expand and invest, helped by its sea based yard which can also carry refit projects. Down under Australian builders, had also an interesting expansion and while Riviera was in receivership period for a year or so the company actually came out stronger from these dark times, and along with the USA Sea Ray and Tiara is an interesting competitor to the known European quality brands.